Herschel and Planck will be launched aboard an Ariane 5 ECA launcher from French Guiana. While Herschel trains its eye on the invisible infrared universe, Planck will focus on the remnant light of the Big Bang. While astronomicaland cosmological knowledge of the universe has grown by leaps and bounds in thepast few decades, some details remain beyond the grasp of current space- andground-based telescopes ? but not for long. Two spacetelescopes, Herscheland Planck, are set to be launched in tandem by the European Space Agency (ESA)on May 14. They will peer deeper into space and time than any telescope inhistory. NASA getsmost of the attention when it comes to space telescopes, with the HubbleSpace Telescope leading the way (Hubble is however a joint project withESA). But that could soon change. The observationsmade by these two European observatories could revolutionize our understandingof our universe, and answer some "basic questions about our place in theuniverse," said Paul Goldsmith, the NASA project scientist for Herschel at theJet Propulsion Laboratory in Pasadena, Calif., which provided some of the keytechnology for the telescopes. Herschelwill be the largest, most powerful infrared telescope ever launched into space,and its observations in the far-infrared to sub-millimeter wavelengths of lightwill allow astronomers to study some of the coldest objects in space, notvisible in other wavelengths. Herschelwill look for the signature of water in comets in our own solar system, as wellas in the interstellar gas and dust clouds that give rise to stars and planets. WhenHerschel peers into those clouds, it will also be looking into the womb of starformation and should be able to see the formation of proto-stars for the firsttime. Thetelescope will also look back in time to get the first good glimpse at theintense star formation early in the universe's history in young galaxies thatshine brightly in the infrared. "Herschel'sgoing to really end up rewriting the books on how stars form," Goldsmith said. Meanwhile,Planck will be looking in the microwave part of thespectrum, mapping the fossil light of the universe, the Cosmic MicrowaveBackground (CMB) that is the relic radiation of the Big Bang, and learning moreabout the universe in its infancy. Planck willbe able to look at fluctuations in the CMB in more detail than ever before,which will tell astronomers more about how the large-scale structures of theuniverse ? from galaxies to large voids ? formed and evolved. "Planckwill provide the most precise data on the early Universe ever. We have neverbeen so close to the Big Bang," said Rashid Sunyaev, director of the MaxPlanck Institute for Astrophysics in German, which provided some of thesoftware for Planck. Planck willalso turn its eye on two of the universe's most mysterious quantities: darkmatter and dark energy. Thetelescopes will be sent into space aboard an Ariane 5 ECA launcher from theGuiana Space Centre in Kourou, French Guiana. They will maketheir observations from the L2 Lagrangianpoint of the sun-Earth system ? a gravitational stability point in spaceabout 1 million miles (1.5 million kilometers) from Earth in the oppositedirection of the sun ? freeing the instrumentation from the interferingradiation of the sun, Earth and moon. 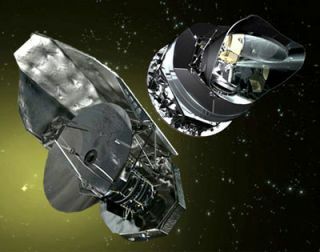 It will betwo months before Planck and Herschel reach their final destination, and oncethey do, all their systems will have to be checked out before astronomers canstart probing the heavens. Goldsmith estimates that the first observations willcome in October. Herscheland Planck won?t last forever ? they are slated for 3.5-year and 15-monthmissions, respectively. There is some possibility of extending those missions,but ultimately the helium that cools their instruments will run out. But evenwithout an extension, each mission promises to enhance our understanding of theuniverse we live in, and right now, astronomers are ?waiting eagerly for thingsto get going,? Goldsmith said.